Citation: Horowitz M. "Interview with Albert Hofmann". High Times. 11. 1976. I was at first not in agreement with the idea of publishing this interview [in High Times]. I was surprised and shocked at the existence of such a magazine, whose text and advertising tended to treat the subject of illegal drug with a casual and nonresponsible attitude. Also, the manner in which High Times treats marijuana policy, which urgently needs a solution, does not correspond to my approach. Nevertheless, I came to the decision that my statement's appearing in a magazine directed to readers who use currently illegal drugs might be of special value and could help to diminish the abuse or misuse of the psychedelic drugs. Michael Horowitz convinced me that an accurate description of the discovery of LSD and the Mexican magic plants, about which so many misleading versions exist, and my opinion on the various aspects of the drug problem, among other topics, would be useful to a large audience of interested persons in the United States. The aims of this interview are to provide Information about what these kinds of drugs can and cannot do, and what their potential dangers are. At the height of World War II, four months after the first artificially created nuclear reaction was released in a pile of uranium ore in Chicago, an accidentally absorbed trace of a seminatural rye fungus product quietly exploded in the brain of a 37-year-old Swiss chemist working at the Sandoz research laboratories in Basel. He reported to his supervisor: "I was forced to stop my work in the laboratory in the middle of the afternoon and to go home, as I was seized by a peculiar restlessness associated with a sensation of mild dizziness...a kind of drunkenness which was not unpleasant and which was characterized by extreme activity of imagination ... there surged upon me an uninterrupted stream of fantastic images of extraordinary plasticity and vividness and accompanied by an intense, kaleidoscope like play of colors...."
Three days later, on April 19, 1943, Dr. Albert Hofmann undertook a self-experiment that both confirmed the results of his earlier psychoactive experience and revealed a fascinating new discovery: Here was the first known substance that produced psychic effects from dosages so tiny they were measurable only in micrograms! 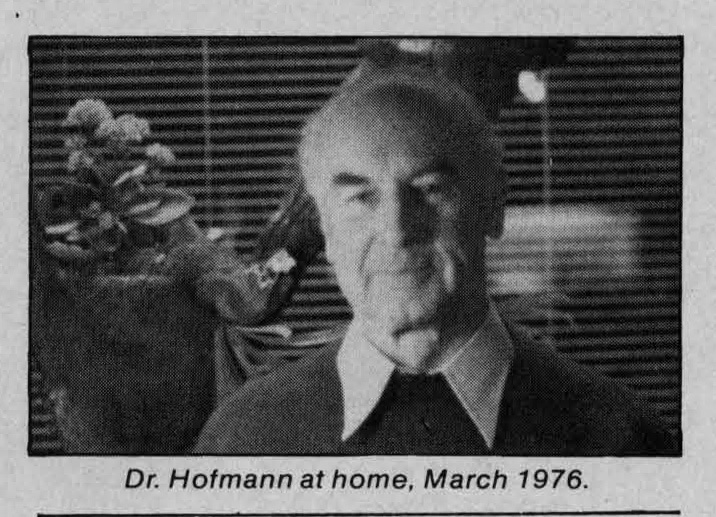 Dr. Hofmann had discovered LSD-25. Lysergic acid diethylamide (LSD) was enthusiastically investigated by the European psychiatric profession as a possible key to the chemical nature of mental illness. Its effects were believed to mimic the psychotic state. As soon as LSD was introduced to American psychiatry in 1950, interest spread rapidly among the United States military and domestic security interests. By the middle 1950s, LSD was being researched as a creativity enhancer and learning stimulant; rumors of its ecstatic, mystic and psychic qualities began to leak out through the writings of Aldous Huxley, Robert Graves and other literary luminaries. A large-scale, nonmedical experiment involving LSD and other psychedelic drugs at Harvard in the early Sixties precipitated a fierce controversy over the limits of academic freedom and focused national attention on the drug now known as "acid." Midway through the turbulent decade, one million people had tried black-market LSD, engendering a neurological revolution the fallout of which has not yet been assessed. In 1966, Congress outlawed LSD. Dr. Hofmann now lives in comfortable retirement on a hill overlooking the Swiss-French border. He granted High Times this exclusive interview to discuss not only the implications of his discovery of LSD, but also his less publicized chemical investigations into the active agents of several sacred Mexican plants. Considering his life's work, Dr. Hofmann seems a likely candidate for the Nobel Prize in chemistry. Not only have his discoveries broadened our knowledge of psychoactive chemicals and triggered the imaginations of thousands of scientists, historians and other researchers, but they have had a direct and revolutionary impact on humanity's ability to understand and help itself. What work did you do prior to your discovery of LSD? In the early years of my career in the pharmaceutical research laboratory of Sandoz in Basel, I was occupied mainly with investigations on the cardiac components, the glycosides, of squill, or Scilla maritima. These investigations resulted in the elucidation of the chemical constitution of the common nucleus of these agents, which provide valuable medicaments that are often used in the treatment of cardiac failure. From 1935 I worked on the alkaloids of ergot, resulting in the development of ergonovine, the first synthetic preparation of natural ergot alkaloids: Methergine, used in obstetrics to stop hemorrhage; Hydergine for geriatric complaints. 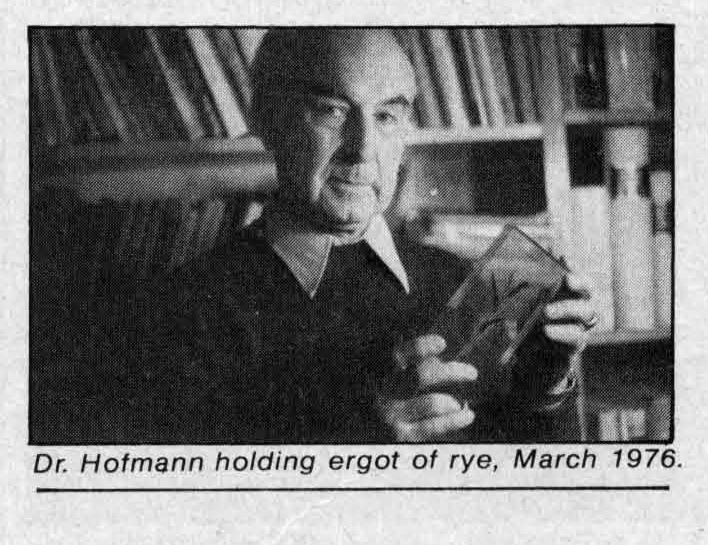 In 1943 the results of this first period of my research in the ergot field were published in a professional journal, Helvetica Chimica Acta. As a result of my first eight years of ergot research, I synthesized a large number of ergot derivatives: amides of lysergic acid, lysergic acid being the characteristic nucleus of natural ergot alkaloids. Among these amides of lysergic acid there was also the diethylamide of lysergic acid. Did you have LSD in your laboratory as early as 1938? Yes. At that time a number of pharmacological experiments were carried out in Sandoz 's department of pharmacology. Marked excitation was observed in some of the animals. But these effects did not seem interesting enough to my colleagues in the department. Work on LSD fell into abeyance for a number of years. As I had a strange feeling that it would be valuable to carry out more profound studies with this compound, I prepared a fresh quantity of LSD in the spring of 1943. In the course of this work, an accidental observation led me to carry out a planned self-experiment with this compound, which then resulted in the discovery of the extraordinary psychic effects of LSD. What sort of drug were you trying to make when you synthesized LSD? When I synthesized lysergic acid diethylamide, laboratory code name LSD-25 or simply LSD, I had planned the preparation of an analeptic compound, which means a circulatory and respiratory stimulant. Lysergic acid diethylamide is related in chemical structure to nicotinic acid diethylamide, known to be an effective analeptic. Was the discovery of LSD an accident? I would say that LSD was the outcome of a complex process that had its beginning in a definite concept and was followed by an appropriate synthesis that is, the synthesis of lysergic acid diethylamide--during the course of which a chance observation served to trigger a planned self-experiment, which then led to the discovery of the psychic effects of this compound. Does "LSD-25" mean that the preparation of LSD with the characteristic psychoactive effects was the twenty-fifth one you made? No, the number 25 behind LSD means that lysergic acid diethylamide was the twenty-fifth compound I had prepared in the series of lysergic acid amides. In the published report of your first LSD experience on April 16, 1943, at 3:00 P.M. in Basel, you write of a "laboratory intoxication." Did you swallow something or breathe a vapor or did some drops of solution fall upon you? No, I did not swallow anything, and I was used to working under very clean conditions, because these substances in general are toxic. You have to work very, very cleanly. Probably a trace of the solution of lysergic acid diethylamide I was crystallizing from methyl alcohol was absorbed through the skin of my fingers. How big a dose did you take that first time, and what were the nature and intensity of that experience? I don't know--an immeasurable trace. The first experience was a very weak one, consisting of rather small changes. It had a pleasant, fairy tale-magic theater quality. Three days later, on April 19, 1943, I made my first planned experiment with 0.25 milligrams, or 250 micrograms. Yes, I prepared a solution of 5 milligrams and took a fraction corresponding to 250 micrograms, or 25 millionths of a gram. I didn't expect this dose to work at all, and planned to take more and more to get the effects. There was no other substance known at the time which had any effect with so small a dose. "From my LSD experiments...I have received knowledge of not only one, but of an infinite number of realities." Did your colleagues know that you were making this experiment? Were you familiar with the work done on mescaline by Klüver, Beringer and Rouhier in the late 1920s before you yourself experimented with mind-altering substances? No--I became interested in their work only after the discovery of LSD. They are pioneers in the field of psychoactive plants. Mescaline, studied for the first time by Lewin in 1888, was the first hallucinogen available as a chemically pure compound; LSD was the second. Karl Beringer's investigations were published in the classic monograph Der Meskalinrausch in 1928, but in the years following, interest in the hallucinogenic research faded. Not until my discovery of LSD, which is about 5,000 to 10,000 times more active than mescaline, did this line of research receive a new impetus. How long were you able to keep writing lab notes that afternoon? Not very. As the effects intensified I realized that I did not know what was going to happen, if I'd ever come back. I thought I was dying or going crazy. I thought of my wife and two young children who would never know or understand why I could have done this. My first planned self-experiment with LSD was a "bum trip" as one would say nowadays. Why was it four years from your discovery of the psychic effects of LSD until your report was published? Was your information suppressed? There was no suppression of that knowledge. After confirmation of the action of this extraordinary compound by volunteers of the Sandoz staff, Professor Arthur Stoll, who was then head of the Sandoz pharmaceutical department, asked me if I would permit his son, Werner A. Stoll--who was starting his career at the psychiatric hospital of the University of Zurich--to submit this new agent to a fundamental psychiatric study on normal volunteers and on psychiatric patients. This investigation took a rather long time, because Dr. Stoll, like myself and most young Swiss people in that period of war, often had to interrupt his work to serve in the army. This excellent and comprehensive study was not published until 1947. Did government agents aware of LSD approach you during World War II? Before Werner Stoll's psychiatric report appeared in 1947, there was no general knowledge of LSD. In military circles in the 1950s, however, there was open discussion of LSD as an "incapacitating drug" and thus "a weapon without death." At that time the U.S. Army sent a representative to Sandoz to speak to me about the procedure for producing large quantities of LSD. Of course, the plan to use it as an "incapacitating agent" was not practicable because there was no way of uniformly distributing doses--some would get a lot and some would get none. Discussions of the military uses of LSD were no secret at that time, although some journalists speak as if they were. Arthur Stoll's name appears with yours on the chemical paper where the synthesis of LSD is first described. What was his connection with this investigation? Stoll's name appears on all papers coming out of the research laboratories at Sandoz as part of his function of head of the department, but he had no direct connection with the discovery of LSD. He was one of the pioneers in ergot research, having isolated in 1918 the first chemically pure alkaloid from ergot--ergotamine--which proved to be a useful medicament in the treatment of migraine. But then research on ergot was discontinued at Sandoz until I started it again in 1935.
Who was the second person to take LSD? 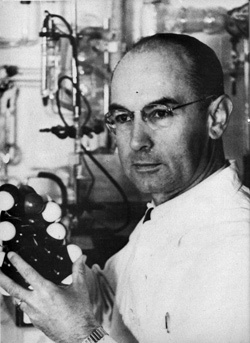 Professor Ernst Rothlin, head of the Sandoz pharmacological department at the time. Rothlin was dubious about LSD; he claimed he had a strong will and could suppress the effects of drugs. But after he took 60 micrograms--one quarter of the dose I had taken earlier--he was convinced. I had to laugh as he described his fantastic visions. Have you taken LSD outside of the laboratory? Around 1949 to 1951, I arranged some LSD sessions at home in the friendly and private company of two good friends of mine: the pharmacologist Professor Heribert-Konzett, and the writer Ernst Juenger. Juenger is the author of, among other works, Approaching Revelation: Drugs and Narcotics [Annaeherungen; Drogen und Rausch. Stuttgart: Klett. 1970]. I did this in order to investigate the influence of the surroundings, of the outer and inner conditions on the LSD experience. These experiments showed me the enormous impact of--to use modern terms--set and setting on the content and character of the experience. I also learned that planning has its limitations. In spite of good mood at the beginning of a session--positive expectations, beautiful surroundings and sympathetic company-- once fell into a terrible depression. This unpredictability of effects is the major danger of LSD. How long and how often did you continue to take LSD? My ten to 15 experiments with LSD were distributed over 27 years. The last one was in 1970. Since then I have taken no more LSD, because I believe that all an LSD experience can give me has already been given. Maybe later in my life I will have the need to take it once or several times more. What was the largest single dose of LSD that you took? Would you recommend the use of LSD? I suppose that your question refers to the nonmedical use of LSD. If such use were at present legal, which is not the case, then I would suggest the following guidelines: The experience is handled best by a ripe, stabilized person with a meaningful reason for taking LSD. With regard to its psychic effects and its chemical constitution. LSD belongs to that group of Mexican drugs, peyotl, teononocotl and ololiuqui, that became sacred drugs because of their uncanny way of affecting the core of the mind. The Indians' religious awe of the psychedelic drug may be replaced in our society by respect and reverence, based on scientifically established knowledge of its unique psychic effects. This respectful attitude toward LSD must be supplemented by appropriate external conditions-by choosing an inspiring milieu and selected company for the session, and having medical assistance available just in case it is needed. Are the effects of ergotism similar to those of LSD? There are two forms of ergotism: ergotismus gangrenosus and ergotismus convulsivus. The former is characterized by symptoms of gangrene, but without accompanying psychic effects. In the latter form, contractions and convulsions of the muscles often culminate in a state comparable to epilepsy--a condition sometimes accompanied by hallucinations, and thus related to the effects of LSD. This can be explained by the fact that the alkaloids of ergot have the same basic nucleus as LSD; that is, they are derivatives of lysergic acid. "I have learned ... that the Russians have studied LSD's uses in military and parapsychological investigations, and that they were searching for an antidote." Is the term psychedelic, coined by Dr. Humphry Osmond, agreeable to you? I think it is a good term. It corresponds better to the effects of these drugs than hallucinogenic or psychotomimetic. Another suitable designation would have been phantastica, coined by Louis Lewin in the 1920s, but it was not accepted in English-speaking countries. You have described your psychoactive drug investigations as a "magic circle." What do you mean? My investigations of lysergic acid amides brought me to LSD. LSD brought the sacred Mexican mushrooms to my attention, which led to the synthesis of psilocybin, which in turn brought about a visit from Gordon Wasson and the subsequent investigations with ololiuqui. There I again encountered lysergic acid amides, closing the magic circle 17 years later. Can you describe the events leading up to that? After having studied the mushroom ceremony in Mexico during 1954 and 1955, Gordon Wasson and his wife invited the mycologist Roger Heim to accompany them on a further expedition in 1956 in order to identify the sacred mushroom. He discovered that most of them: were a new species belonging to the genus Psilocybe mexicana of the family of Strophariaceae. He was able to cultivate some of them artificially in his Paris laboratory, but after unsuccessful attempts to isolated the active principle, he sent the sacred mushrooms to the Sandoz laboratory in hopes that our experience with LSD would enable us to solve this problem. In a sense, LSD brought the sacred mushrooms to my laboratory. We first tested the mushroom extract on animals, but the results were negative. It was uncertain whether the mushrooms cultivated and dried in Paris were still active at all, so in order to settle this fundamental point I decided to test them on myself. I ate 32 dried specimens of Psilocybe mexicana. Isn't that a large dose? No. The mushrooms were very tiny, weighing only 2.4 grams--a medium dose by Indian standards. Everything assumed a Mexican character. Whether my eyes were closed or open. I saw only Mexican motifs and colors. When the doctor supervising the experiment bent over to check my blood pressure, he was transformed into an Aztec priest, and I would not have been astonished had he drawn an obsidian knife. It was a strong experience and lasted about six hours. The mushrooms were active; the negative results of the test with animals had been due to the comparatively low sensitivity of animals to substances with psychic effects. Did you then proceed with the synthesis? After this reliable test with human beings , meaning that my coworkers and I ingested the fractions to be tested, I extracted the active principles from the mushrooms, purified and finally crystallized them. I named the main active principle of Psilocybe mexicana psilocybin and the accompanying alkaloid, usually present only in small amounts, psilocin. My coworkers and I were then able to elucidate the chemical structure of psilocybin and psilocin, and after that we succeeded in synthesizing these compounds. The synthetic production of psilocybin is now much more economic than obtaining it from the mushroom. Thus teonanacatl was demystified--the two substances whose magic effects made the Mexican Indians believe for thousands of years that a god resided in a mushroom can now be prepared in a retort. In one of his recorded lectures, Aldous Huxley described the delight of Wasson's famous curandera, Maria Sabina of Huautla, upon ingesting psilocybin. She realized that she could now perform magic all year 'round, and not just during the mushroom season following the rains. That was my psilocybin. When Wasson and I visited Maria Sabina there were no sacred mushrooms because it was so late in the season, so we provided her with pills containing synthetic psilocybin. After taking a rather strong dose in the course of a nocturnal session, she said there was no difference between the pills and the mushrooms. "The spirit of the mushroom is in the pill," she said--final proof that our synthetic preparation was identical in every respect with the natural product. What prompted your investigations of ololiuqui, another of the Mexican sacred plants? When Wasson came to Sandoz to view the synthetic psilocybin crystals in my laboratory, he was delighted that the results of our chemical investigation had confirmed his ethnomycological studies of the sacred mushroom. We became friends and made plans to further investigate Mexican sacred plants. The next problem we decided to tackle was the riddle of ololiuqui, which is the Aztec name for the seeds of certain morning-glories. With Wasson's help, I was able to obtain ololiuqui seeds collected by Zapotec Indians. The chemical analysis of the ololiuqui seeds gave a quite surprising result. The active principle that we isolated proved to be lysergic acid amide and other ergot alkaloids. So ololiuqui is chemically related to LSD? Yes. The main ololiuqui alkaloid is lysergic acid amide, which differs from LSD--from lysergic acid diethylamide--only by two ethyl radicals. I did not expect to find lysergic acid derivatives--which were known until then only as products of lower fungi of the ergot type--also in higher plants, in morning glory species of the phanerogamic family of the Convolvulaceae. My results were so surprising that the first paper I delivered on the subject in Melbourne in 1960 was received by my colleagues with skepticism. They would not believe me. "Oh, you have so much lysergic acid compounds in your laboratory, you may have contaminated your ololiuqui extracts with them," they said. What was the purpose of your journey to Mexico? It was an expedition that Wasson organized in the autumn of 1962 to search for another, unidentified magic Mexican plant, namely the so-called hojas de la Pastora. We traveled by horseback on Indian trails through the Sierra Mazateca, finally arriving in time to assist in a nocturnal ceremony in the hut of a curandera who used the juice of the leaves of hojas de la Pastora. Afterwards we were able to get some specimens of the plant. It was a new species of the mint family that was later identified botanically at Harvard University and named Salvia divinorum. Back in my laboratory at Sandoz, I had no success in extracting the active principle, which in Salvia divinorum is very unstable. Are the psychoactive effects of Salvia divinorum similar to those of Psilocybe mexicana and LSD? "My first planned self-experiment with LSD was a 'bum trip,' as one would say nowadays." What writers do you find to be the most successful in conveying the psychedelic experience in literature? I find the best descriptions in Aldous Huxley's books. After that I would say Timothy Leary and Alan Watts; in France, Henri Michaux. In German literature, Rudolf Gelpke deserves to be named in this respect, but I don't believe his works are available in English. "Von Fahrten in den Weltraum der Seele" ["Travels in the Cosmos of the Soul"], published in the journal Antaios in 1962, is especially fine. I should also mention the new monograph by Dr. Stan Grof, Realms of the Human Unconscious [New York: Viking, 1975] , containing excellent descriptions of LSD sessions in the framework of psychiatric studies. Did Herman Hesse or Carl Jung ever show an interest in your discovery? I never met Hesse, but his books--especially The Glass Bead Game and Steppenwolf--have deeply interested me in connection with LSD research. It is possible that Hesse experimented with mescaline in the 1920s as some have supposed--I have no way of knowing. Outside of one brief meeting with Jung at an international congress of psychiatrists, I had no contact with him. Did you ever meet Aldous Huxley? Twice. I met him for lunch in Zurich in 1961, and again in 1963 when we were both in Stockholm attending the WAAS [World Academy of Art and Science] Conference, where the topics of overpopulation, depletion of natural resources and ecology in general were discussed. I was deeply impressed by Huxley: he radiated life, intelligence, kindness and openness--and he was of course extremely articulate. What do you think of The Tibetan Book of the Dead as a guide to the psychedelic experience, as suggested by Huxley and the Harvard researchers, among others? The general ideas and instructions on how to prepare and run a psychedelic session given there are the outcome of long experiences in this field and seem very valuable. What disturbs me is the use of the foreign Tibetan symbolism. I prefer that we remain within our own cultural framework--that we use symbols found in the writings of Western mystics such as Silesius, Eckhart, Boehme and Swedenborg. What was your impression of Dr. Timothy Leary's work with psychedelics? I formed my first impression of Dr. Leary in 1963. At that time he was involved, together with his colleague Dr. Richard Alpert, at Harvard University in a project investigating the use of LSD and psilocybin in the rehabilitation of convicts. Dr. Leary sent me an order for 100 grams of LSD and 25 kilograms of psilocybin. Before the sales department of Sandoz could carry out the demand for this extraordinarily large quantity of psychedelic compounds we asked Dr. Leary to provide us with the necessary import license from the U.S. health authorities. He failed to provide it. The unrealistic manner with which he handled this transaction left the impression of a person unconcerned with the regulations of society. I got a glimpse of another facet of his character when he invited me later the same year to participate in a meeting on drug research at Zihuatanejo, Mexico. He emphasized that radio, television and journalists of the most important mass media would be present, which revealed a very publicity-conscious personality. You met with Leary later, didn't you? 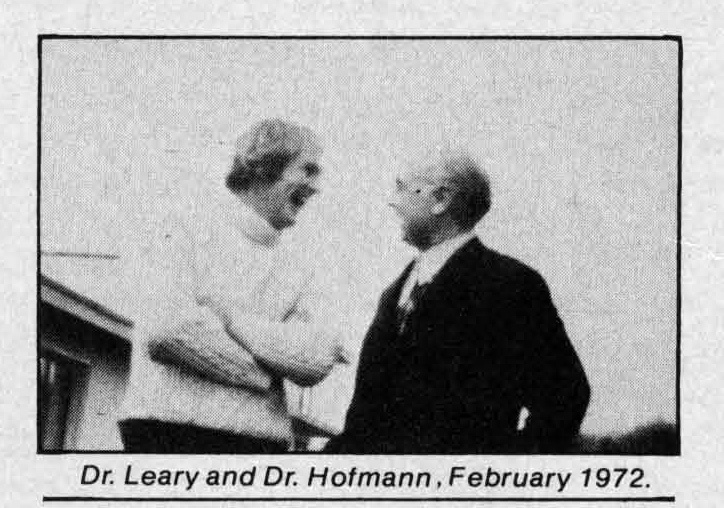 A decade later when Dr. Leary had escaped from prison and was living in exile in Switzerland. I was eager to meet him personally, having read so much in the press about him during the intervening period. On the third of September, 1971, the father and prophet of LSD met in Lausanne. I was surprised to meet not a professorial type of scientist, nor a fanatic, but a slender, smiling, boyish man, representing rather a tennis champion than a Harvard professor. During the course of our conversation, Dr. Leary gave me the impression of an idealistic person who believes in the transforming influence of psychedelic drugs on mankind, is conscious of the complexity of the drug problem and yet was careless of all the difficulties involved in the promotion of his ideas. Apart from his personal style, what did you think of Dr. Leary's ideas at the time of the Swiss meeting? We were in agreement concerning the enormous importance of making a fundamental distinction between drugs. We agreed that the use of addiction-producing drugs, especially heroin with its disastrous somatic and psychic effects, should be avoided by any means possible. We agreed also in the evaluation of the potentially beneficial effects of psychedelic drugs. We disagreed as to the extent that psychedelics should be used and by whom. Whereas Dr. Leary advocated the use of LSD under appropriate conditions by very young people, by teenagers, I insisted that a ripe, stable personality be a prior condition. Ripe because the drug can release only what is already in the mind. It brings in nothing new-it is like a key that can open a door to our subconscious. Stabilized because it needs spiritual strength for handling and integrating an overwhelming psychedelic experience into the exising Weltbild. Does LSD possess aphrodisiac qualities? Only in the sense that LSD adds new dimensions to all experiences, including of course the sexual. Have you benefitted financially from your discovery of LSD? Sandoz is one of the largest pharmaceutical firms in the world. How did it deal with the manufacture and distribution of so controversial a substance as LSD? It was clear from the very beginning that LSD, in spite of its extraordinary qualities, would not become a pharmaceutical preparation of commercial value. Notwithstanding this, Sandoz put enormous effort into the scientific investigation of the substance, showing the eminent role LSD could play as an excellent tool in brain research and in psychiatry. Sandoz therefore made LSD available to qualified experimental and clinical investigators all over the world to promote such research with technical help and in many instances with financial support. Sandoz played a noble role in the scientific development of LSD. Did Sandoz stop producing LSD because it was finding its way onto the black market? At the onset of the LSD hysteria in 1965, Sandoz completely stopped the distribution of LSD for research purposes in order to avoid all possibility and to counteract false rumors that its LSD could find its way onto the black market. Another reason was to force health authorities of different countries to provide adequate rules and regulations regarding the distribution of LSD. After this was accomplished, they again supplied LSD in America to the FDA [Food and Drug Administration] for distribution, but only to licensed investigators. "At age 19 I made the decision to become a chemist for both mystical-philosophical reasons and for reasons of curiosity." In the United States there has been a recent major investigation of improper LSD experiments carried out by the CIA , Army, Navy and other governmental agencies. Did they get their LSD from Sandoz just as Timothy Leary's psychedelic research project at Harvard got theirs? Sandoz supplied the U.S. Food and Drug Administration, who then distributed it in America. Probably that is how the CIA and others got it. Have you ever been approached by Soviet agents in need of Sandoz LSD or of your expertise? This has not happened. I have learned from Swedish scientists in Stockholm that the Russians have studied LSD's uses in military and parapsychological investigations, and that they were searching for an antidote. But the pharmaceutical firm of Spofa in Prague probably provided the LSD. Are you familiar with the underground chemist, Stanley Owsley, who in the 1960s produced the most widely distributed black-market LSD? I have heard his name mentioned in this context. but know nothing else about him. What has been the purity of the black-market LSD that you've tested? Some contained the "labeled" amount, some less. It's difficult to make a stable preparation under less than perfect laboratory conditions. You must eliminate every trace of oxygen. Oxidation destroys LSD, as does light. Are you familiar with an LSD-like substance called ALD-52 that figured prominently in an acid trial two years ago? Yes. ALD-52 is Acetyl- LSD, a modification of LSD that proved to be as active, because acetyl is removed in the body and you have the effects of LSD. It has only been used experimentally. We sent it to the Drug Rehabilitation Center in Lexington, Kentucky, for testing some years ago. What do you know about ketamine? Ketamine is a totally synthetic psychedelic, unlike LSD , which is a semi natural product. What is now known about the neurological effects of LSD and other psychedelics? We know LSD concentrates in the hypothalamus, the same region of the brain where serotonin is found. This is the brain's emotional center. But there still exists a big gap between the pharmacology of and the mechanisms underlying consciousness. The problem is that the thought-function that you investigate is the same instrument you use for investigation. For many people LSD provides what they describe as a religious experience. What are your feelings on this? People for whom LSD provides a religious experience expect to have such an experience when they take it. Expectation--which is identical to autosuggestion--determines to a high degree what will happen in the session, because one of the most important features of the LSD state is its extreme suggestibility. Another reason for the incidence of religious experiences is the fact that the very core of the human mind is connected with God. This deepest root of our consciousness, which in the normal state is hidden by superficial rational activities of the mind, may become revealed by the action of the psychedelic drug. Is LSD an evolutionary agent? Possibly. In the LSD state we may become conscious, in the words of Teilhard de Chardin, of the "entire complex of interhuman and intercosmic relations with an immediacy, an intimacy and a realism" that otherwise happen only in spontaneous ecstatic states and to a very few blessed people. Agreement exists among spiritual leaders that the continuation of the present development, characterized by increasing industrialization and overpopulation, will result in the exhaustion of natural resources and destroy the ecological basis for mankind's existence on this planet. This trend to self-annihilation is reinforced by international politics based on "power trips" and the preparation of weapons of apocalyptic potential. This development can be stopped only by a change in the materialistic attitude that has caused this development. This change can result only from insight into the deepest spiritual roots of life and existence, from comprehensive use of all forces of our intelligence and all resources of our knowledge. This intellectual approach, supplemented by visionary experience, could produce an alteration of the consciousness of truth and reality that could be of evolutionary significance. LSD selectively and wisely used could be one means of supplementing intellectual with visionary insight and helping the prepared mind become conscious of a deeper reality. Did your LSD experiences change your personal life and tastes? It increased my sensitivity to classical music--especially Mozart. My life habits did not change. Has your wife also experimented with psychedelics? Yes. Once in Mexico in the session with Salvia divinorumi> when I had some gastric trouble and could not ingest the juice, she took my place. She also took some of the psilocybin pills during the historic session when Maria Sabina confirmed their potency. What general medical uses might LSD be marketed for in the future? Very small doses, perhaps 25 micrograms, could be useful as a euphoriant or antidepressant. Which of your works are available in English? Several years ago Dr. Richard Evans Schultes of Harvard and I coauthored a book called The Botany and Chemistry of Hallucinogens. It is intended primarily to provide specialized students with basic knowledge of the botany and chemistry of hallucinogenic plants. I am currently writing my memoirs, but these will first be published in German. What have you been doing since your retirement from Sandoz? I retired in 1971 after 42 years with Sandoz. Since then I have been writing and lecturing on psychoactive drugs. Here at home I work in the orchard and run in the woods for exercise. It's wonderful to be able to spend a great deal of time in unspoiled nature after decades of work in laboratories. In his book Gravity's Rainbow, the American author Thomas Pynchon has described a stained glass window in your office at the otherwise dull Sandoz labs. Is this true? That is true. It is now here in my house. Actually, it's a modern glass in the old style depicting Asclepius and his mentor, the centaur Chiron. Are the Swiss proud of your discovery of LSD and the synthesis of psilocybin and ololiuqui, or has the controversy surrounding these drugs dispelled that? My discoveries have proved very controversial. Some consider these drugs to be diabolique, and a few clergymen asked me to confess mea culpa in public, but in professional circles my work has been appreciated. I've been honored by the National Polytechnic Institute here in Switzerland; by honorary degrees in natural science and in pharmacy from the Swedish Royal Pharmaceutical Institute, and in the United States by an honorary membership in the American Society of Pharmacognosy. What made you decide to become a chemist? I was interested in knowing what our world is made of. Chemistry is the science of the constituents of the world, so at age 19 I made the decision to become a chemist for both mystical-philosophical reasons and for reasons of curiosity. Has LSD affected your philosophical outlook? From my LSD experiments, including the very first terrifying one, I have received knowledge of not only one, but of an infinite number of realities. Depending upon the condition of our senses and psychic receptors we experience a different reality. I realized that the depth and richness of the inner and outer universe are immeasurable and inexhaustible, but that we have to return from these strange worlds to our homeland and live here in the reality that is provided by our normal, healthy senses. It's like astronauts returning from outer space flights: they must readjust to this planet. In some of my psychedelic experiences I had a feeling of ecstatic love and unity with all creatures in the universe. To have had such an experience of absolute beatitude means an enrichment of our life. How would you like the future ages to remember you and your discovery? Perhaps the image of a chemist riding along on a bicycle on the very first LSD trip will change to the Old Man of the Mountain.